The Green Wall is leaving Columbus with $200,000. 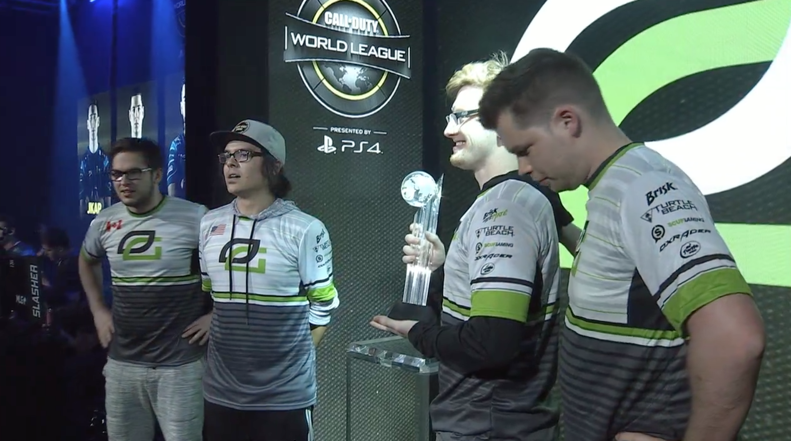 The second season of the Call of Duty World League Global Pro League came to an end earlier today, with OpTic Gaming lifting the trophy as the Stage Two champions. Over 100,000 Call of Duty fans tuned in on MLG.tv and Twitch to watch Seth “Scump” Abner, Matthew “FormaL” Piper, Damon “Karma” Barlow, and Ian “Crimsix” Porter take down Team EnVyUs in the grand finals of the CWL Stage Two Playoffs on Sunday at the MLG Arena in Columbus, Ohio. Sunday’s action started with OpTic absolutely dominating Luminosity in the losers bracket semifinals. The Green Wall surprisingly swept the CWL Anaheim Open champions, taking Retaliation Hardpoint 250-138, Throwback Search and Destroy 6-3, and Frost Uplink 11-1. After losing this series, Luminosity was eliminated from the Stage Two Playoffs in fourth place. Team EnVyUs then followed in OpTic’s footsteps with another surprising 3-0, as the boys in blue swept eUnited. EnVyUs won Retaliation Hardpoint 250-155, Throwback Search and Destroy 6-2, and Frost Uplink 5-2 to send eUnited down to the losers bracket. After struggling against the boys in blue, eUnited bounced back with an impressive 250-193 win on Throwback Hardpoint in the first map against OpTic of the losers bracket finals. But OpTic responded by winning the next two maps, taking Crusher Search and Destroy 6-4 and Throwback Uplink 7-4. James “Clayster” Eubanks and crew wouldn’t go down without a fight, however, as they won yet another Hardpoint to force a decisive game five. But the Green Wall prevailed in Search and Destroy once again, taking Retaliation 6-3 in order to eliminate eUnited in third place. With OpTic taking down two extremely talented teams in the losers bracket, an “eClasico” rematch was set up in the grand finals. And the Green Wall carried this momentum into their matchup against the boys in blue. OpTic reset the bracket with a 3-1 victory in the opening series of the grand finals. The Green Wall took Breakout Hardpoint 250-236 and Retaliation Search and Destroy 6-4 before EnVyUs bounced back with an 8-4 win on Precinct Uplink. OpTic then won Scorch Hardpoint 250-238 to force a second winner-take-all best-of-five series in the grand finals. The Green Wall continued to play well as they opened the second series with a 250-194 win on Throwback Hardpoint. But the boys in blue took care of business in the following map, winning Crusher Search and Destroy 6-5 to even the series at one map apiece. On the third map, Frost Uplink, Jordan “JKap” Kaplan missed a one-point throw to secure the buzzer-beater win for EnVyUs. With the score tied at 8-8, the game went into overtime—and OpTic ended it quickly with a 33 second dunk. With a 2-1 advantage in the series, OpTic closed out the grand finals in dominating fashion with a 250-153 victory on Retaliation Hardpoint, winning the Stage Two Playoffs. OpTic made an impressive run through the losers bracket, and won two best-of-five series against EnVyUs in the grand finals—so they proved any doubters wrong by winning this tournament. The Green Wall will now look to carry this momentum into the $1.5 million Call of Duty World League Championship, which starts on Aug. 9.